The IWRM short course is delivered by The University of Queensland (UQ) in a five-week program in Australia and a three-week program in Kenya. The course exposed African irrigation practitioners to state of the art world leading irrigation practises in Australia. 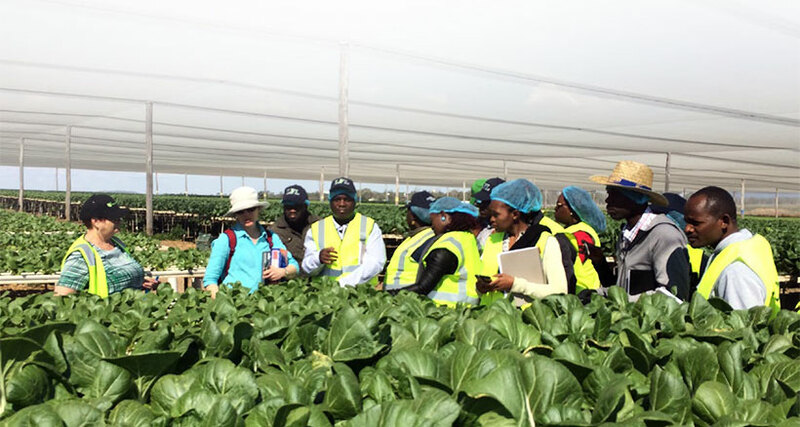 The Kenya program linked Australian and African practises to promote the adoption of irrigation practises that are economically sound and environmentally sustainable to enhance food security in Africa. The IWRM short is delivered by UQ International Development and aims to support African agricultural production and assist with sustainable development. Course participants are provided with current theoretical knowledge and practical skills to underpin policy development in irrigation and sustainable water resources management. Knowledge and skills from the course will help participants create change to improve sustainable yields and water-use efficiency, and reduce the risk of crop failure in African farming systems. A key outcome of the course is the implementation of acquired knowledge and skills. Participants use their new skills to develop a post-course project, the Reintegration Action Plans (RAP), to promote and foster adoption of sustainable and efficient irrigation technologies. The West Africa IWRM group will meet in Nigeria between 25th and 28th March 2019 to fine tune their RAP. There will be a series of workshops to discuss and assess the post course project. Former Australia Awards alumni from related courses in Agricultural land management will join the group and share their experience with Australia Awards Africa and implementation of post course projects. To combine theory and practice the group will visit Alabata Dam and discuss Irrigation from a Nigerian perspective. A highlight of the program is the Symposium Irrigation and Water Resources Management: Achieving Impact for Africa on 28th March 2019. This event will bring together IWRM experts, academics, and practitioners to inform leading international and national government and non-government organisations throughout West Africa on the actions required to foster the adoption of best practices in IWRM. The symposium will make recommendation on required Agriculture research, development and extension (RD+E) activities for irrigation practices in West Africa. Throughout the post-course workshop and the Symposium, the diversity in the profile of those in attendance – male and female participants, alumni, and guests who are IWRM academics, practitioners, researchers, and policy makers – will contribute to well-rounded discussions to achieve the desired outcome of the event. Working groups at the Symposium will focus on key topics of: i) Empowering women and youth in decision making for irrigated crop management; ii) Enabling end-user access to irrigation technology; and iii) Enhancing sustainable water management practices through knowledge transfer. The Australia Awards program, funded by the Australian Government and managed by the Department of Foreign Affairs and Trade, offers emerging global leaders the opportunity to study, research and participate in professional development activities in Australia, and high-achieving Australians similar experiences overseas. Media: Ms Alessia Anibaldi, Manager, UQ International Development, a.anibaldi@uq.edu.au +61 432 154 235. Australia Awards opportunities are offered annually and are managed by the Australian Department of Foreign Affairs and Trade (DFAT). They contribute to the achievement of development objectives across a range of sectors. Australia Awards Short Courses are targeted programs of intensive training provided for selected cohorts of scholars to address specific technical or soft skills gaps. They are formal study or training opportunities delivered by an approved Australian higher education provider or an Australian Registered Training Organisation, either in Australia or partner countries. The scholar group is geographically and organisationally diverse. 5 weeks in Australia (Brisbane, Darling Downs, Central Queensland) and 3 weeks in Kenya. The primary objective of the IWRM program is to provide African scholars with an enhanced knowledge of irrigation and water resource management practice and principles. The course will contribute to economic and social development in Africa, while promoting Australia as an active partner in African development, by equipping scholars with the skills, knowledge and experience to make a positive impact on sustainable economic development in their country, profession, workplace and community. Draws on expertise from UQ’s School of Agriculture and Food Sciences and UQ Business School. Scholars will have extensive opportunities to engage with a wide range of agriculture and irrigation businesses and research facilities. Scholars will also undertake activities designed to build skills in leadership, communication and project management. One of the leading university development groups in the Asia Pacific Region. Provides development expertise and program management leadership to help build the capacity of people and organisations around the world to achieve their development goals. This is done through client focussed, professionally managed activities that connect and apply the knowledge and expertise of The University of Queensland. UQID’s work includes long-term development activities, customised short term training programs and aid advisory services. Since 1994, has successfully contributed to more than 500 projects across 80 countries. In addition to Agribusiness and IWRM, UQID implements the Local Economic and Social Development in the Extractives, and Public-Private Infrastructure Partnerships courses.